TANAKA FARMS WELCOMES HELLO KITTY & FRIENDS! Sweet New Experiences with Some Familiar Faces! Tanaka Farms is excited to announce a unique partnership with global brand, Sanrio! Hello Kitty and her friends made their debut at our Pumpkin Patch on September 30, 2017. Hello Kitty has brought happiness and friendship to people of all ages for over 40 years. Her friends include beloved Chococat, My Melody, Pochacco, and Keroppi! We are honored to have our new friends help us welcome you to our family-owned farm. Friendly faces and photo stops will be plentiful around the farm and there will be exclusive Tanaka Farms+Sanrio merchandise for fans. Please keep checking back as we announce upcoming Sanrio events that will be held right here at our farm in the upcoming year! 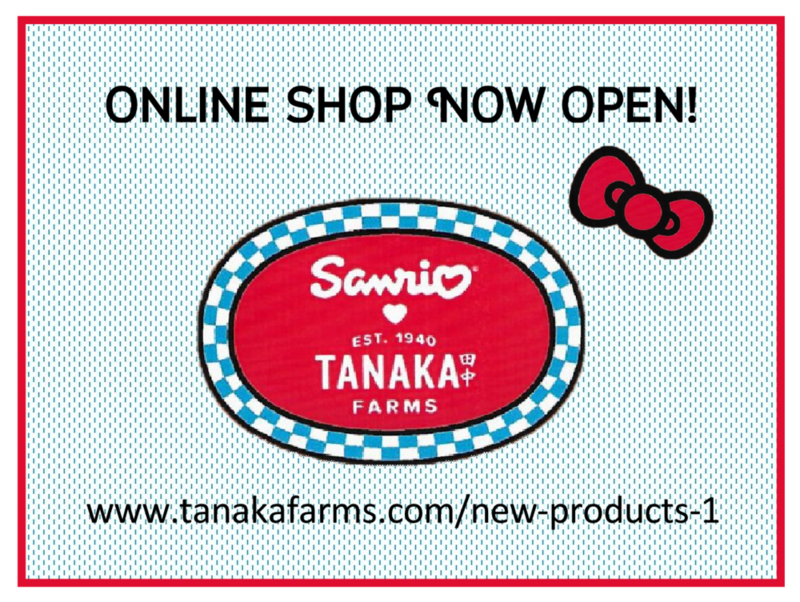 Thank you for your interest in our limited edition co-branded Sanrio-Tanaka Farms merchandise! Each season we will bring new items into the store. All merchandise is subject to availability. Items move QUICKLY so please call ahead if you are looking for something specific. Public Drinking Water Is Not Available. Bring your own or bottled water is available for purchase at $2.00 bottle. FOR YOUR SAFETY we recommend wearing comfortable shoes that you don't mind getting dirty. Please avoid wearing sandals/flip-flops, open-toed shoes or high heels. In complying with insurance policies, and for your protection, PETS and WAGONS are prohibited.